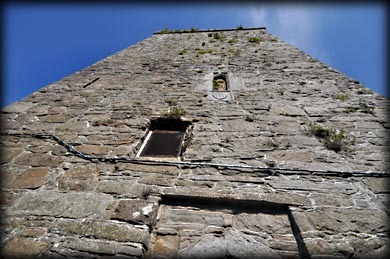 The medieval tower at Ballyhale is known locally as 'Ballyhale Castle'. 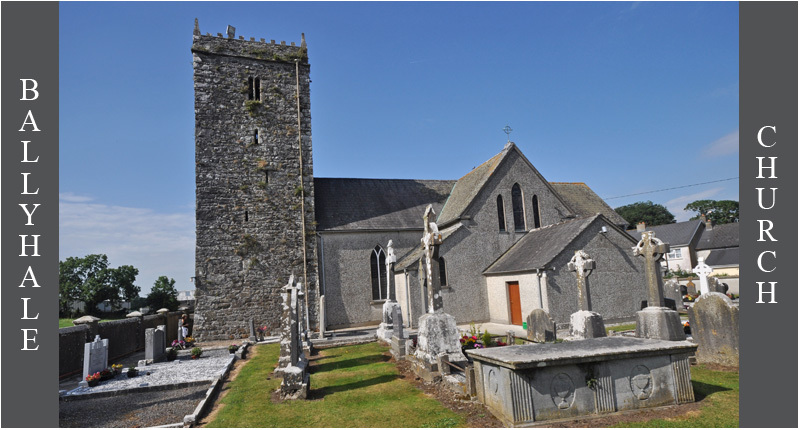 In the 'History of Ossory' by Rev William Carrigan (1860-1924), he stated that the medieval tower served as a presbytery and the gothic doorway in the west wall was the entrance to the old medieval church. In the National Inventory it is described as a tower house, but the structure appears to be too narrow to be built purely as a tower house. It reminded me of St Munna's Church at Taghmon, Westmeath, which is an excellent example of a medieval church with a fortified residence. The present Catholic Church of St Martin of Tours, was attached to the east side of the tower during the 19th century, when the medieval tower was adapted as a bell tower. High on the west wall above the doorway is a niche containing a Madonna and Child statue. Below it is a plaque bearing the Butler coat of arms. 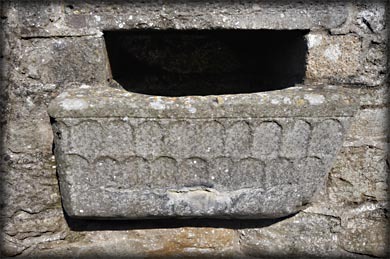 Inserted in the wall, to the right of the doorway, is the possibly romanesque font pictured below right. Situated: From Thomastown in Kilkenny head southwest on the R448 for 9 kilometres. Then take a right turn in the centre of town. The church is on your right. Discovery Map 67: S 5425 3538. Last visit July 2017.